We want to take a quick moment to ask you to please consider participating in our short, 9 question survey regarding Incredible Years social media. We have spent the last 6 months doing a lot of “revamping” – we delved in to the world of Facebook and Twitter, and started this blog! It has been a great experience for us and we are enjoying these new outlets to get the word out, but now we want to hear from you. What information do you want to hear about? How can we make things easier for you? As we start to think about going in to the new year, your input is incredibly valuable as we develop new content! 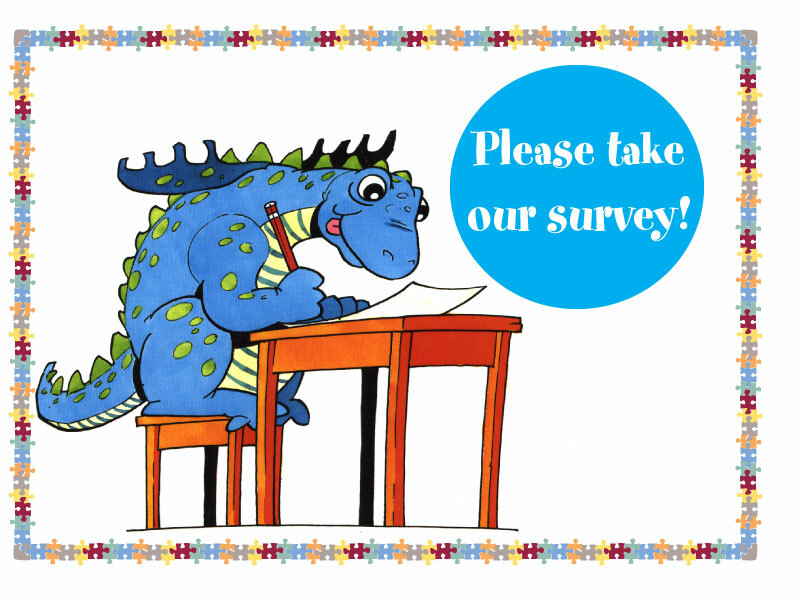 If you have a spare couple of minutes, please take the survey, or even feel free to send us an e-mail with your feedback (incredibleyears@incredibleyears.com). THANK YOU! Categories: Customer Feedback, Incredible Years | Tags: Customer Feedback, Incredible Years, Social Media, Survey | Permalink. Before we get started, an exciting announcement: Incredible Years is now on Twitter! Follow us for up to date news and information! We wanted to finish up the main portion of our website tutorial. We hope this has been useful as you all get used to the new website! As always, feel free to contact us at any time with questions about where things can be found on our website. Let’s start with the “Learn More” section. Depending on where you are in the website, the links here will change. These are very important links! They will lead to further information based on the section of the website you are looking at. For example, if you go to the orange tool bar and hover over “Programs” and then click “Parent Training Programs” you will be taken to the main page for parent programs. The “Learn More” section then has links to each of the different parent programs with specific information to each program. See the illustration below! The next two sections in the side bar, “Quick Menu” and “Newsletter Sign up” will be the same no matter what page you are on. The Quick Menu has links to common sections of the site, such as the Frequently Asked Questions and Workshop Schedule. The Newsletter Sign Up is just what is sounds like! If you have not yet had a chance to sign up for our monthly newsletter, you are welcome to use this Opt-In form to do so (you can unsubscribe at any time). Our newsletters contain information on upcoming trainings, new research, product information, and more! If you have a moment, please take this quick poll to let us know if these tutorials have been helpful! Thank you! Also, stay tuned for another exciting Guest Blog Post from Carolyn Webster-Stratton, regarding new research on using Incredible Years® Programs with mothers in the jail system. 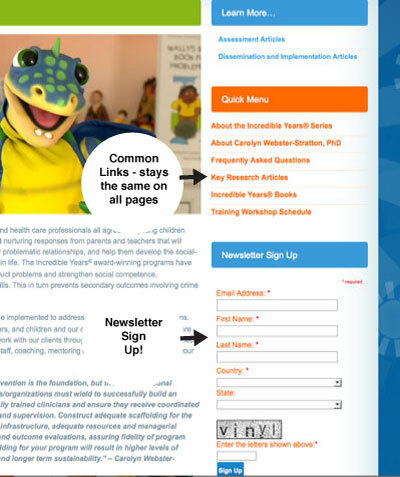 Categories: Customer Feedback, New Website, News | Tags: child programs, evidence based programs, Incredible Years, New Website, parent programs, teacher programs, Tutorial | Permalink.